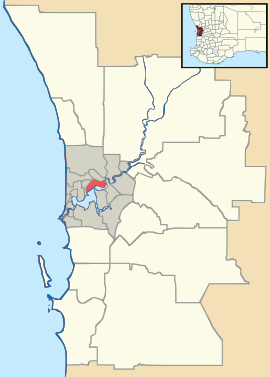 Scarborough is a coastal suburb of Perth, Western Australia, located approximately 14 km northwest of the city centre in the City of Stirling local government area. It was named after the English beach resort Scarborough, North Yorkshire. It has a population of about 14,300 people (2011 census), of whom about 25% were born overseas, mostly in the United Kingdom, and has a landmark high-rise hotel, the Rendezvous Observation City, originally built in 1986 for Alan Bond whose intention was to profit from anticipated accommodation demand when the 1987 America's Cup challenge was held at nearby Fremantle. Scarborough beach was the venue for the Australian Surf Life Saving Championships for the years 2007, 2008, 2009 and 2014. Scarborough is located roughly 14 kilometres from the Perth city centre. The suburb of the city is located approximately 24 kilometres from the airport. Scarborough Beach is an entertainment precinct with restaurants, bars and a nightclub. Since 1999, the local council has deployed a strategy for issues including traffic, parking, zoning, coastal landscape and recreation. One of the issues was whether or not to allow further high-rise development on Scarborough Beach. The 24-level Observation City hotel development (now Rendezvous) had been very controversial in the 1980s, but proceeded despite a long and intense public campaign against high-rise beachfront development. :p176 Perth businessman Alan Bond, who built Observation City, had ambitious plans to convert the entire Scarborough Beach "strip". After securing most of the real estate his plans failed to proceed due to an inability to purchase the family owned fast food restaurant Peter's by the Sea. The restaurant, still present today, refused to sell despite Bond making inflated offers on the property, and has taken on historical significance with the locals ever since. Subsequent amendments by the City of Stirling have specified a height limit of eight storeys.. In the WA Inc Royal Commission Report of October 1992, former Liberal premier Ray O'Connor was found to have been given money by Bond Corp with which to bribe Stirling City Councilors who approved the controversial Observation City development. It was also noted in the report that instead of handing the money to the planned recipients, he kept the money for himself. Scarborough Primary School is in the community. The Japanese School in Perth was previously located in Scarborough. ^ Australian Bureau of Statistics (31 October 2012). "State Suburbs: Scarborough". 2011 Census QuickStats. Retrieved 4 July 2012. ^ LovePerth (1 May 2012). "Love Perth Not a Greasy Doner in Sight". Retrieved 2012-08-04. ^ "パース日本人学校ホームページ." (Archive) The Japanese School in Perth. 14 July 2003. Retrieved on 4 January 2014. "157 Deanmore Rd. Scarborough W.A.6019"
This page was last edited on 20 October 2018, at 18:07 (UTC).